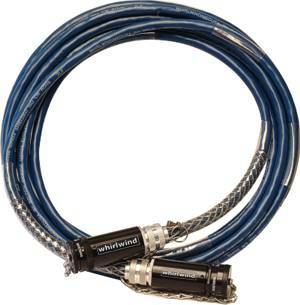 Here is a great idea for adding subsnake and patching capability to a new or an existing splitter system. 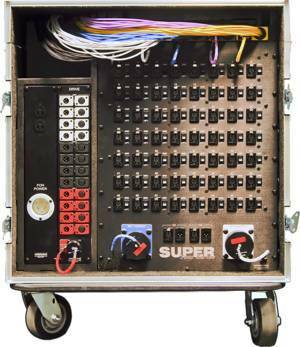 The PatchMaster incorporates five W1 multipin inputs connected directly to color-coded tails. The tails exit through grommets so they may be retracted into the panel. Tails can be dressed to length for a neat appearance and unused tails can be pushed back and out of the way. 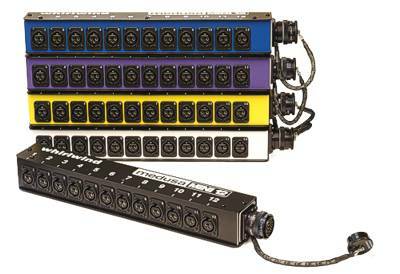 Snakeskin™ color-coded dustcaps wired through to four sets of output tails, 8 channels each. Mini-12) and patch the tails to any of your inputs. This system also eliminates the possibility of connecting two mic lines to the same input XLR. Pick any 5 of the Mini-12, MultiSnake12 or DrumDrop color-coded boxes and connect them to the PatchMaster with "C" series W1 - W1 cables. After you've patched your channels for the first time, it's a simple job to drop the boxes at various points on the stage and get connected and patched with only 5 cables to the splitter. Color-coded and handy to drop wherever needed. 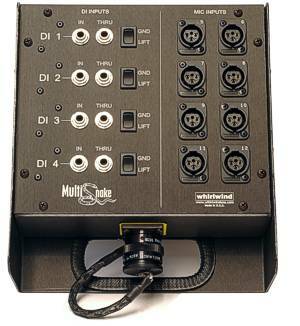 4 DIs and 8 XLR channels for backline, keyboards or vocals plus acoustic instruments out front. W1 male to W1 female, available in various lengths.